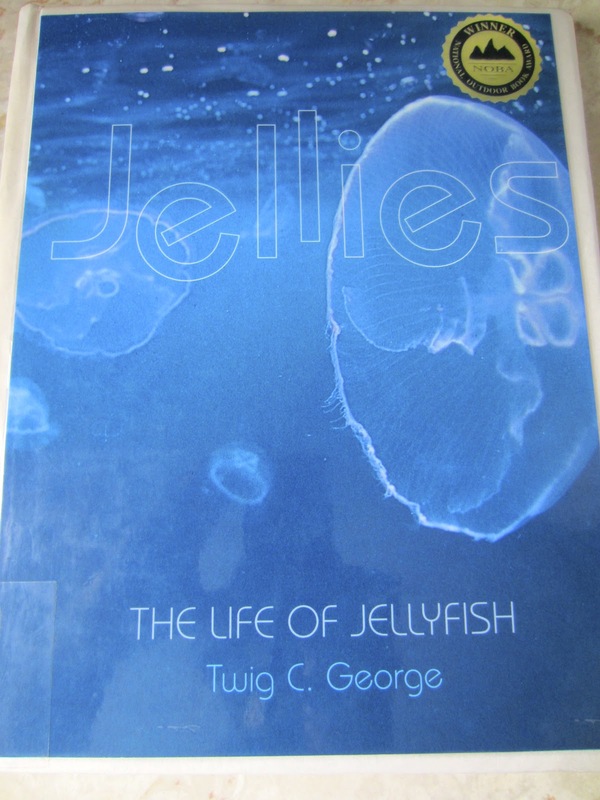 Our book of the week: Night of the Moonjellies. Seaside food-stands, work ethic and responsibility, jelly fish and ocean life. We took a look at it all. "Mark spends a busy, noisy day helping out at Gram's seaside hot-dog stand. After the last customer is served and the grill is scrubbed to a silvery shine, Mark sails off with Gram for a promised surprise-- and finds a nighttime sea full of shimmering moonjellies." - from the front cover. We looked at life in the deep blue. 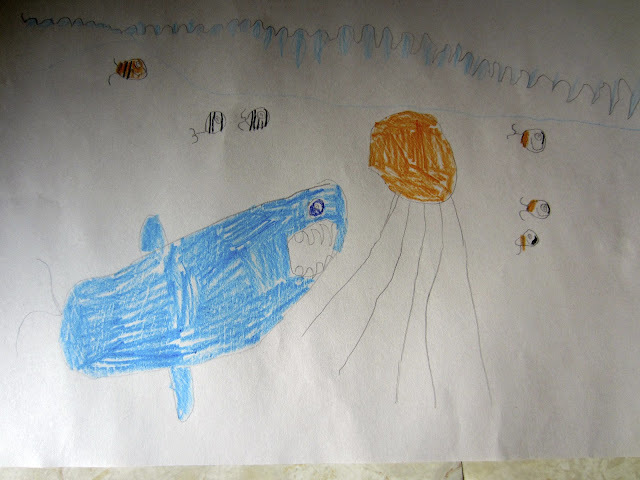 The boys each drew a picture of life in the Ocean. Abishai's shark about to eat a moonjelly. I picked this book up from the library; Awesome Ocean science. I got the name of the book from Delightful Learning. 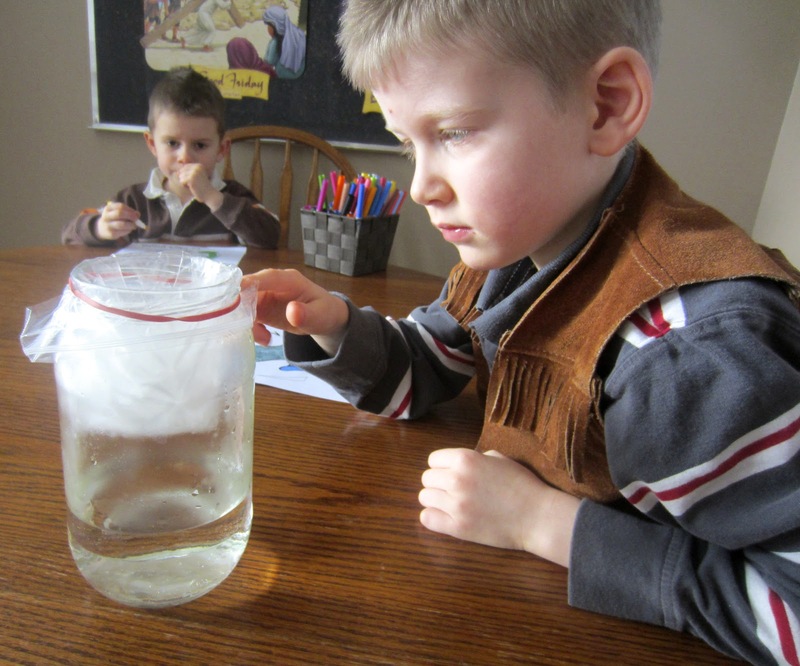 It has a lot of fun and easy ocean science experiments. We did an experiment called Floating Made Easy. We set out to see how much salt it would take to bring our chunk of carrot up from the bottom of our fresh water glass to float at the top. We added 1/2 tsp of salt at a time. Abishai kept track of how many teaspoons we added using tally marks. 3 teaspoons later and our carrot was floating. 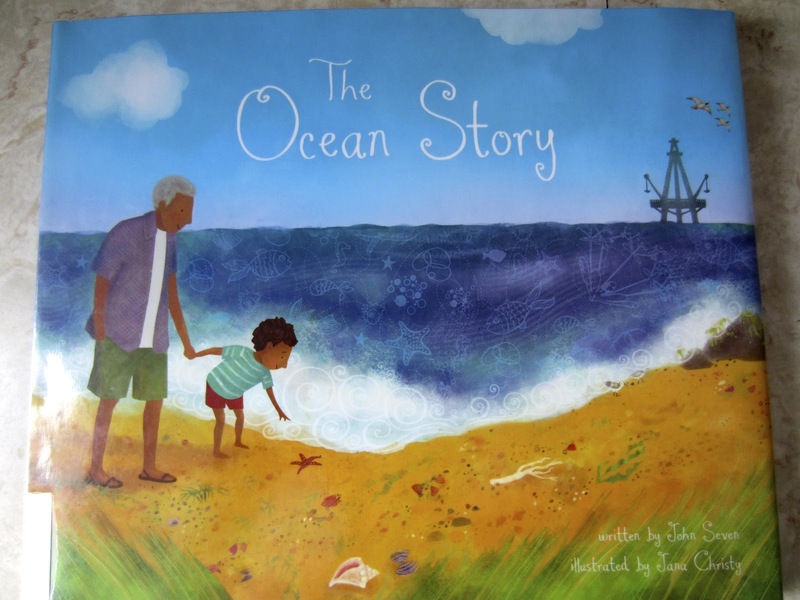 One of the many books that we read about the Ocean. This particular book mentioned water evaporation. We did an experiment a while back on it here and here. 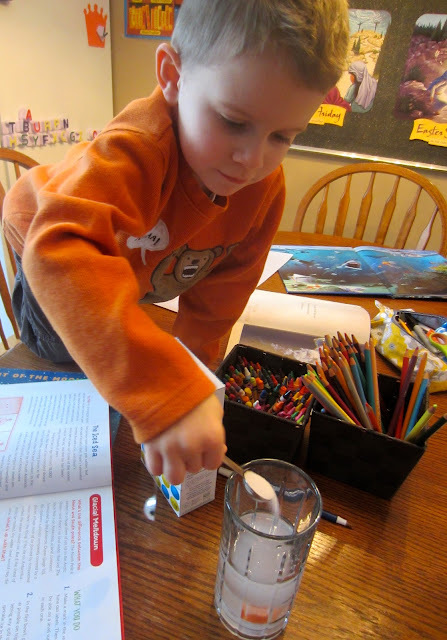 So we pulled out our Awesome Ocean Science book and did an experiment called It's Raining in a Jar. 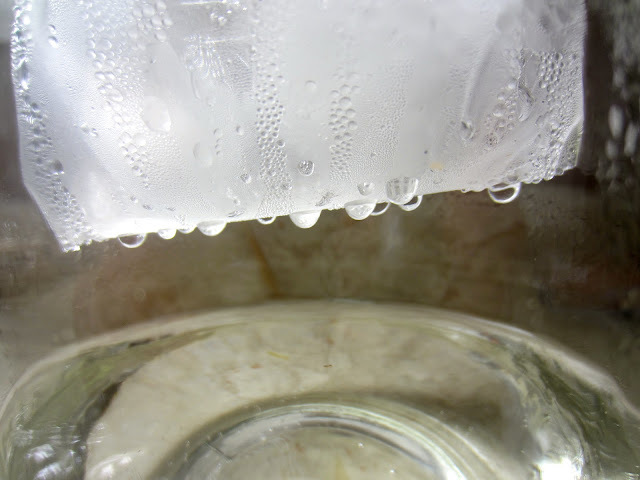 We filled a jar with 2" of hot tap water (our mini tropical sea), inserted a sandwich bag into the top part of the jar (our atmosphere), filled the bag with ice cubes (our cooler air) and waited 15-20 minutes (more like 30-40 minutes) for the warmer water to evaporate into the atmosphere, "form clouds" and then rain back down to earth again. Getting ready for the rain! We explored our five senses. Abishai asked me if he could colour a hammerhead shark. By the end of the week he was drawing it free-hand in church. Out of all the books on jellyfish that we took out of the library, I liked this one the best. It told jellyfish facts in a more of a story telling way which helps to engage young children (and adults, for that matter). We don't live near the ocean, so when I saw this idea on Delightful Learning and Our Homeschool Fun, I wanted to try it with my boys. 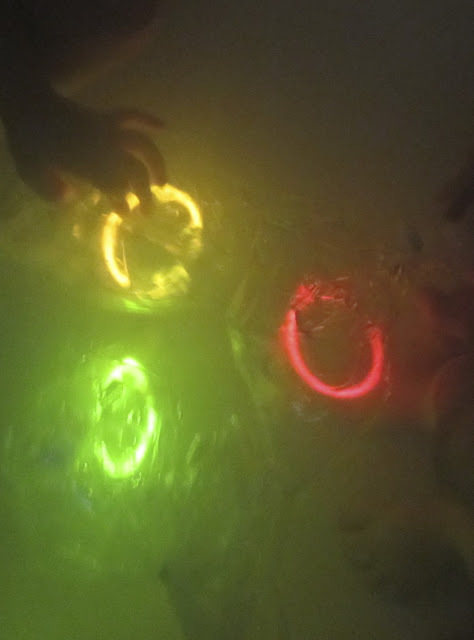 I made the boys some moonjellies out of glow sticks placed in sandwich bags full of water. After darkening the bathroom and placing the moonjellies in the water, I invited the boys to come and play with the jellyfish. Abishai asked me if they were real. I answered his question with a question, "would you want them to be real?" "no", he said,"because they would sting us." Wow, did the three of them have fun! 7 year old Mark, from Night of the Moonjellies helped out at his Gram's seaside hot dog stand two days a week. I asked Abishai and Micaiah to create their own restaurant. Abishai came up with the name 'Cowboy Burger Restaurant' and made a sign for it. Micaiah and Asher sat down as customers (It is very hard to play patiently with a 16 month old baby. The older boys create while Asher destroys). I took a turn at being a customer too! Abishai made his own menu. We found this changeable template at Homeschool Share. I find some of Abishai's food names and descriptions funny and cute. We used our printable Canadian money from A Pair of Red Clogs unit to practice coin recognition. A continuation of 'Cowboy Burger Restaurant' moved to the upstairs living room. We watched a couple Ocean videos. Abishai played around with oil pastels and experimented with smudging them for the very first time. This is the part in the book where Mark and his Gram release the moonjelly he found washed up on the beach earlier that day. Back into the ocean with the other moonjellies! Finally, Asher-baby playing with his favourite bumblebee toy. He discovered pop-a-wheelies with it the other day. 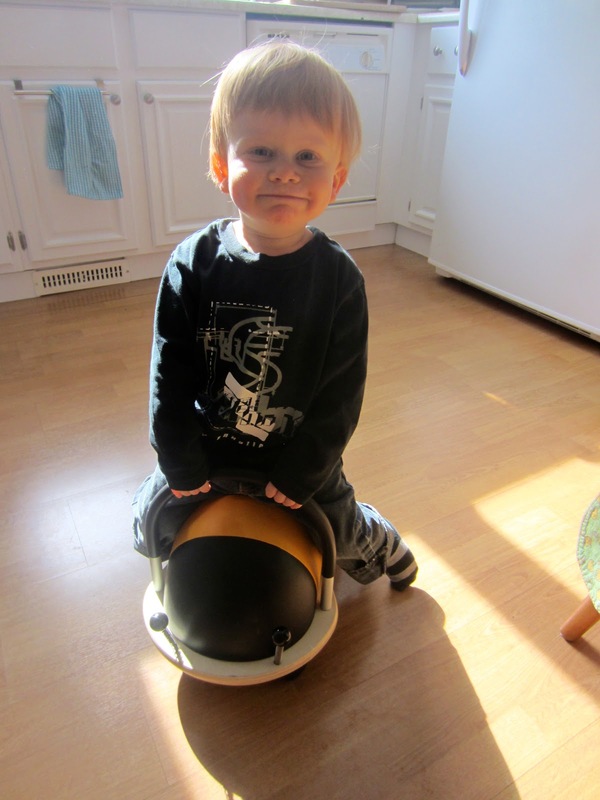 There's no shortage of "He's all boy" in our house.